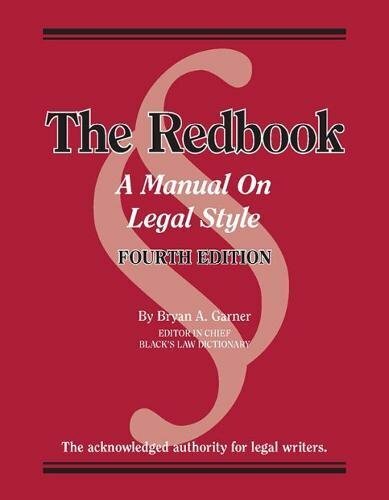 Since first appearing in 2002, Bryan Garner's The Redbook: A Manual on Legal Style has established itself as the go-to source for all questions of legal style (apart from citation form). The book isn't just one talented man's effort: Garner has two experienced coauthors plus a hands-on team of 54 editorial advisers, most of whom have long and valuable experience teaching LRW. The book is a one-of-a-kind resource--the legal writer's equivalent of The AP Stylebook or The Chicago Manual of Style. The brand-new fourth edition has lots of new material, including an especially helpful new chapter on handling quotations. The two exhaustive indexes (word and subject), plus the detailed table of contents, make it easy to find authoritative guidance within seconds, whatever the question might be. The author, Bryan Garner, is now the most frequently cited author in opinions of the U.S. Supreme Court. It's true: last term, four of his books were cited a total of 14 times (in the somewhat fewer than 90 cases decided). This term the count is on a similar pace. In American appellate decisions generally, Garner is at the top end of sources relied on. You can rely on him, too, in the most comprehensive, nitty-gritty resource available for legal writers: The Redbook. Don’t leave home without it.